Samsung the microSDXC EVO Plus for smartphones, cameras, and other capturing devices. The Samsung MicroSD EVO Plus is perfect for professionals and enthusiasts that want to capture more content. It is designed for smartphones, tablets, cameras, drones, and other devices, making sharing of high-resolution and 4K content easy. Available in capacities of up to a massive 512GB, Samsung 512GB MicroSD EVO Plus offers speeds of up to 100MB/s read and 90MB/s write. The Samsung 512GB MicroSD EVO Plus offer enough storage for 24 hours of 4K UHD video, 78 hours of full-HD video and can hold are much as 150,300 high-resolution photos. It comes bundled with a full-sized SD card adapter for multi-device compatibility. 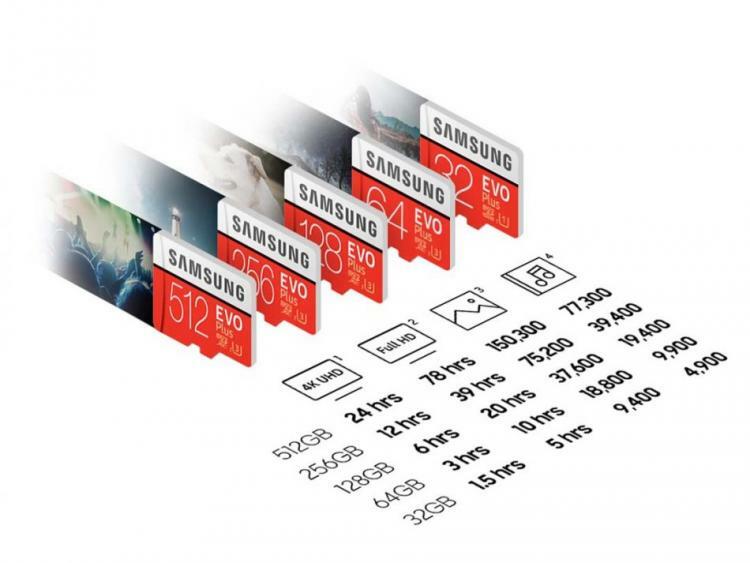 The Samsung 512GB MicroSD EVO Plus also features 4-proof protection: the EVO Plus can withstand up to 72 hours in seawater, extreme temperatures, airport X-ray machines and magnetic fields equivalent to an MRI scanner. The new Samsung MicroSDXC EVO Plus is now available in a wide range of capacities from 32GB to 512GB. The 512GB MicroSDXC EVO Plus gets an MSRP of $199.99 USD. The Samsung microSDXC EVO Plus is covered with a 10-year limited warranty. Learn more about the Samsung microSDXC EVO Plus here.